One hundred fifty years ago today, a force of about 400 Confederate soldiers, riding under the cover of darkness from the Mud River country of southwestern West Virginia, approached the Putnam County town of Winfield, where they recently learned an outpost of federal troops had been established. The Confederates quietly divided into two columns, one led by Capt. 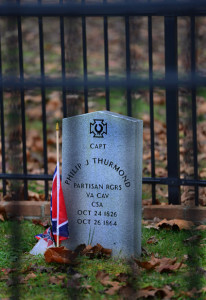 Philip Thurmond of Fayette County, who, along with his brother, William, had raised two companies of men from Fayette, Monroe and Greenbrier Counties early in the Civil War to form Thurmond’s Partisan Rangers. The other column was led by Lt. Col. Vinson A. Witcher, commander of the 34th Virginia Cavalry Battalion, and the leader of the Putnam County operation. While Thurmond’s Rangers operated mainly in or around their home counties early in the war, by 1863 they had been incorporated into a regular army unit, the 44th Virginia Cavalry. Witcher’s cavalry outfit, which included many soldiers from Wayne County, had acquitted itself well at Gettysburg in 1863, and fought in East Tennessee and the Shenandoah Valley earlier in 1864. In September of that year, Witcher’s battalion and Thurmond’s Rangers joined forces in Tazewell, Va., to launch an attack on Union outposts in north central West Virginia. The Confederate raiders captured and burned a small Union fort and its Home Guard garrison at Bulltown in Braxton County, and then raided Weston, where they seized a large quantity of supplies, plus $5,287.85 removed from the Weston Exchange Bank before moving on to Buckhannon, where they captured the Union garrison and its commanding officer. They returned to Greenbrier County with 300 prisoners of war, 400 horses and 200 cattle taken from farmers in the federally controlled area. By mid-October, the Confederate force had moved into the Mud River Valley, where they learned of the Union garrison’s presence at Winfield. Company D of the 7th West Virginia Cavalry had been ordered to Winfield primarily to protect steamboat traffic on the Kanawha River, which flows past the town. An incident that occurred in February of 1864 at nearby Red House Shoals may have had something to do with the posting. On that date, while the steamboat B.C. Levi was lashed to the shoreline, a group of about 30 Confederates boarded the vessel without incident and captured Gen. E.K. Scammon, commander of the Union Army’s Kanawha Division and the namesake of Charleston’s Fort Scammon, along with several of his staff officers and 13 enlisted men. The B.C. Levi was taken four miles downstream and burned. 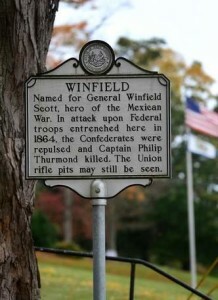 A secondary role for the Union troops at Winfield was to guard the Putnam County Courthouse and the town of Winfield from Confederate attack, not an unpopular task since many of the men in the company came from Putnam and surrounding counties. The men of Company D dug rifle pits and entrenchments adjacent to a mill, around their campsite, and in the vicinity of the brick courthouse, situated on a small rise overlooking the small town and the river behind it. According to written accounts from participants, Witcher’s battalion and Thurmond’s Rangers arrived at the upstream end of Winfield at about 9 p.m., after riding through Teays Valley, and launched their two-pronged attack about 10 p.m. The actions that followed, like hundreds of other bloody skirmishes that took place during the war, did not change the course of history or even garner much attention from either military authorities or the public. But to those involved, such skirmishes could be just as deadly, terrifying and meaningful as a Gettysburg or an Antietam. According to an account in “History of the Great Kanawha Valley With Family History and Biographical Sketches,” published in 1891, and unearthed by Steve Cunningham of Sissonville, regimental historian of the 7th West Virginia Cavalry Association, Witcher led one column of Confederates while Philip Thurmond led the other. “Col. Witcher with half of his force proceeded up the riverbank from the lower end of the town” while Thurmond, “at the head of the other column, reached the federal position by proceeding down a small stream known as Ferry Branch, which enters into the Kanawha at the upper end of the town,” according to the 1891 history book. According to one account, Thurmond’s brother, Elias, was given a pass to be with his brother as he succumbed to a gunshot wound to the abdomen. Thurmond, 38 at the time of his death, was buried in an unmarked grave near the home of Putnam County Judge James Hoge, with the understanding that the Ranger’s family would claim the body for reburial after the war. However, no one came to retrieve the remains until 2010, when the body was exhumed and re-interred in a marked military grave behind the Hoge House, through the efforts of the Sons of Confederate Veterans, the United Daughters of the Confederacy, and others. Thurmond’s brother, William, survived the war and eventually returned to Fayette County, where he bought land in the New River Gorge where he correctly predicted a railroad junction would be built He built houses on his property to rent to railroad employees and their families. By 1875, 75 families were living on Thurmond’s property, along with two general stores and two coal company offices. Thurmond sought to name his new town Arbuckle, the name of a nearby creek, but after a post office was built at the site, government officials named the community Thurmond, now the site of a visitor center in the New River Gorge National River. Reach Rick Steelhammer at 304-348-5169 or rsteelhammer@wvgazette.com.